1. Space between two adjacent teeth in the same dental arch. 2. Fissure or abnormal opening in any part, especially if congenital. 3. Cleft or space between the maxillary lateral incisor and canine teeth, into which the lower canine is received when the jaws are closed; abnormal in humans but normal in dogs and many other animals. 1. a space or cleft. 2. a space between two adjacent teeth in the same dental arch. 3. a narrow zone in the equatorial plane through which the cytosome divides in mitosis. 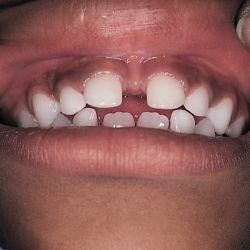 A gap or space between two teeth. a space between two teeth in the same dental arch not caused by the loss of a tooth between them. It occurs most commonly between the maxillary central incisors in adults. 1. Fissure or abnormal opening in any part, especially if congenital. 2. Space between two adjacent teeth in the same dental arch. 3. A space between teeth not due to missing teeth. 4. A space between the upper central incisors in humans, or a space between two adjacent teeth in the same dental arch, especially that between the upper lateral incisor and the adjacent canine, into which the lower canine closes in the Carnivora, such as dogs. a gap in the teeth along the jawbone. In herbivores the diastema separates the incisors from the premolars resulting in an elongation of the jaw and aiding in feeding. 1. [TA] Space between two adjacent teeth in the same dental arch. 2. Cleft or space between the maxillary lateral incisor and canine teeth, into which the lower canine is received when the jaws are closed; abnormal in humans. n an abnormal space between two adjacent teeth in the same dental arch. The gap between the maxillary central incisors is very noticeable. a space or cleft, e.g. the space in the dental arch between the incisors and canines and cheek teeth. Called also interdental space. The prevalence of a diastema of 2 mm or greater was 7. This case presentation shows the treatment of a patient with a minor maxillary midline diastema using removable appliances and elastics. Sin embargo, en algunos puede traer una variedad de complicaciones, como retencion, retraso en la erupcion, erupcion ectopica, diastemas, rotacion axial y reabsorcion radicular de los dientes adyacentes. Doce meses despues se observo mejoria clinica, en donde las relaciones verticales anteriores se han ido corrigiendo disminuyendo la mordida abierta, retroinclinando los incisivos superiores, lo que permite un selle labial competente, asi como el cierre del diastema central (Figura 4). Un frenillo sobreinsertado en el maxilar superior frecuentemente esta asociado a la presencia de diastema entre los dientes incisivos. Orthodontic variables of the subjects including molar relationships, clinically absent teeth, overjet, overbite, open bite, deep bite, crossbite, scissor bite, crowding, lip competency, diastema, syndromes, and temporomandibular joint disorders including clicking, popping, or grating sounds in the jaw joint when opening or closing were evaluated. The most common pathologic findings associated with a mesiodens are retention of the adjacent incisors, malposition, and diastema. Muller used small rectangular magnets directly bonded to the labial aspect of the teeth to close diastema without archwires (33). Diastema between intermediate tooth (itf) and posterior tooth (ptf) wide; diastema between itf and ptf longer than length of ptf. En el arco se pueden encontrar diastemas o apinamiento, diastema es un espacio de . In incisor patterning, Lhx6/7 maintain agenesis of the diastema between the rat incisor and 1st molar [Zhang et al.